Cute Charlie brown sits on a flat car with his little Christmas tree. Pvc Christmas ornament. Reg product Peanuts UFS INC. Measures1 1/2 tall x 3" long. 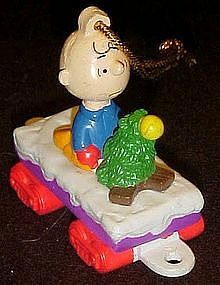 Could be connected to the other Peanuts train ornaments I am listing.